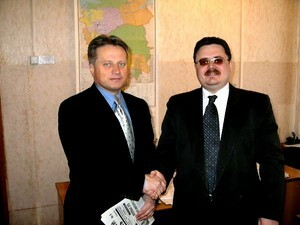 Pavel Klachkov, the member of Eurasia Party Political Council, meets Sergey Batichkov, the co - president of the Popular-Patriotic Union of Russia (NPSR) Council. Recently in Krasnoyarsk Pavel Klachkov, the member of Eurasia Party Political Council, met Sergey Batichkov, the co - president of the NPSR Council in Krasnoyarsk. In the course of the conversation they were exchanging their views on the social-economical situation in Krasnoyarsk region. The perspectives of cooperation and collaboration were being discussed. Pavel Klachkov & Sergey Batichkov achieved the agreements concerning the expediency of the further contacts & the creation of the informational exchange mechanism. Krasnoyarsk press department of the Eurasia party.